If everything went well and we have database up and running, we can proceed to the next step. Go to http://localhost:4200. If everything went fine, you should see a nice welcome message from Angular. We have our frontend part working now! How fast was that? e2e/ - the home of the end-to-end tests. We’re not going to test our app, because we like to live "dangerously", so we’ll pretend that this folder doesn’t exist. node_modules/ - the directory where all modules defined in package.json are installed. We don’t have to worry about it - Node.js handles this for us. src/ - the heart of the frontend part of our project. It contains components, configurations, and assets. src/app/ - the directory of the Angular components, styles, templates and unit tests. src/app/app.module.ts - a very important file. It’s the root module of our app. It declares all used components and modules. src/assets/ - we can keep our fonts, images etc. here. It will be copied on build. src/environments/ - environment-specific configuration files. src/index.html - that’s the file which users get when visiting our app. src/main.ts - the entry point of our app. It bootstraps the AppModule. package.json - contains our project’s dependencies which are installed in node_modules and custom scripts used for building, testing, serving and anything else we want. I think that’s enough to start the work. As mentioned previously, Express is our backend framework. "body-parser" is a middleware that parses request body and makes our life a little easier. 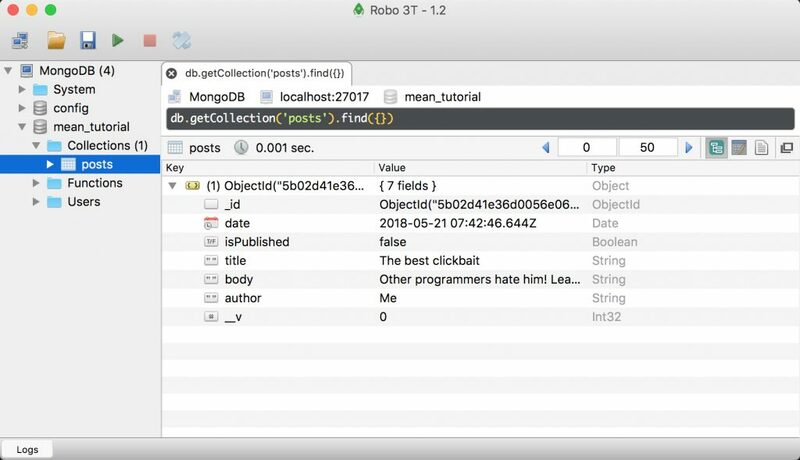 Mongoose is an object modelling tool for MongoDB, it will also help us interact with the database. Nodemon will watch for the changes in our app and restart it automatically. With "concurrently" we will be able to run multiple commands in the same time. First we are mounting our body parser middleware mentioned earlier. We want our frontend part to work on the root path, so we need to serve Angular’s dist folder with express.static(). Our API will be under the /api route. Any other url will lead to the index page. Next we are connecting to the database. By default it’s on mongodb://127.0.0.1:27017 (if you have different settings for MongoDB, you should change this line). mean_tutorial our database name and it will be created automatically by Mongoose. Finally we’re creating our server. To start our server we just need to run node server.js, but remember we also have Angular app which needs to be built and it would be nice if we wouldn’t have to restart the server manually after each change. That’s when concurrently and nodemon come in handy. "concurrently \"ng build --watch\" \"nodemon server.js\""
Now after running npm start our frontend will build, the server will start, it will watch for any changes in the code and restart automatically. Very convenient! If you go to http://localhost:3000 you should still see the default page, but on http://localhost:3000/api we’ll have a short message from the API. There is still no use of the API, so we have to take care of it now. The previous two parts were just a preparation for our project. We have the frontend part working and the server running. It’s time for real work. It’s time for the posts API! Schema is a definition of documents in MongoDB collection. We define our post’s properties here. Schema is compiled into model. Models are responsible for creating and reading documents from the database. Let’s write our first action now. It will create a new post based on a data passed in a request. We are creating a new instance of the post and calling the save method on it (Mongoose handles it), then (if it was successful) we send a response with the created post's data (if it was successful) or with error message (if it wasn’t successful). And that’s it! We only have the POST route for the posts API for now, but we can test if everything works as expected. For convenience I use Insomnia as REST Client and Robo 3T as GUI for MongoDB, but you can use whatever you want. It’s there indeed! It seems like everything works, so we can create all the missing actions in the post controller. Go ahead and check if all other requests work as well. It they do - congratulations! If they don’t - you can check the repo here. That’s it for the first part of the tutorial! As you can see, setting up a project and developing an API on MEAN stack is very straightforward and quick. You have probably noticed that we still have to show our posts in the frontend part of the app. We will take care of it in the next part of the tutorial. So stay tuned! I'm a self-taught web developer. Since childhood I was amazed by computers. I love creating and learning new stuff, be that programming, cooking, playing guitar or doing crafts.